Boca Raton police have released a photo of a key piece of evidence that might help them solve a deadly hit and run. Asia McClave, 20, of Lighthouse Point was crossing the 700 block of West Glades Rd. 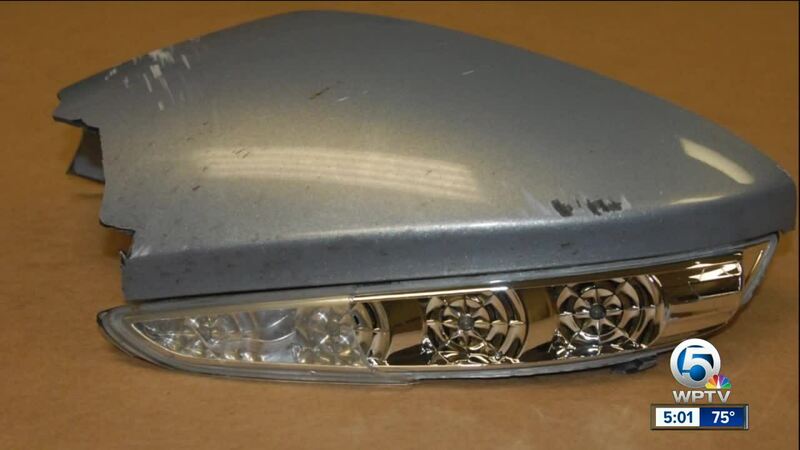 when police said a vehicle struck her in the eastbound lanes Monday night around 7:30 p.m.
Boca Raton police have released a photo of a key piece of evidence that might help them solve a deadly hit and run. Asia McClave, 20, of Lighthouse Point was crossing the 700 block of West Glades Rd. when police said a vehicle struck her in the eastbound lanes Monday night around 7:30 p.m.
McClave died at the scene. Investigators believe the car that struck her is a 2011 or 2012 Hyundai Sonata limited edition which is iridescent silver-blue pearl in color. Police have the side mirror and published the photo on social media Thursday. They have determined the car had a sunroof and leather interior and there was a turn signal and heater element in the side mirror. If you have any information about this crash, please contact Traffic Homicide Investigator Adam Reisner at 561-620-6121.